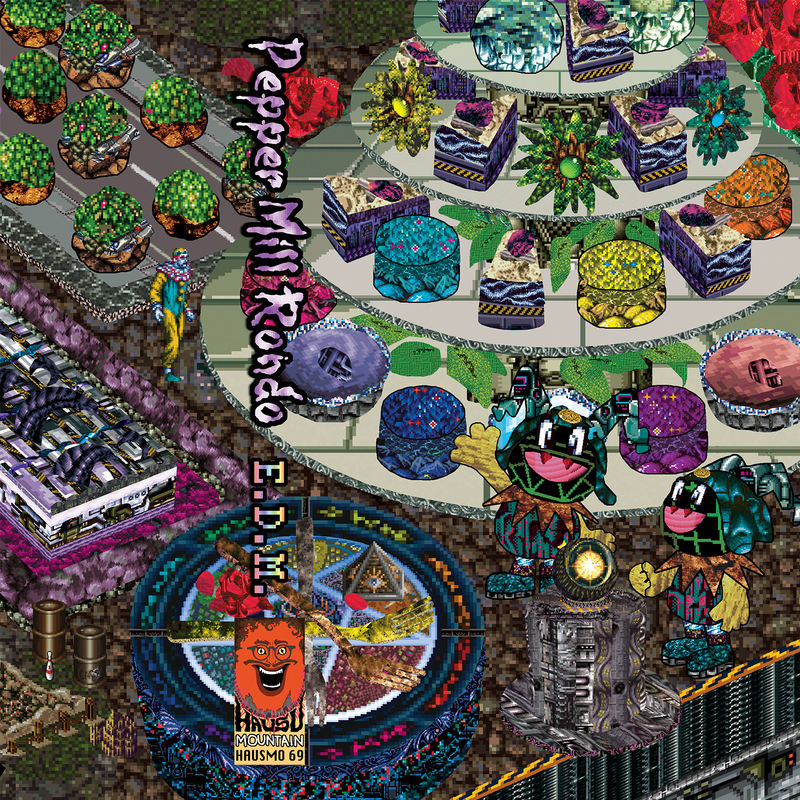 Pepper Mill Rondo – E.D.M. To be released on cassette on 10/19/18. C100 – Silver tape with black imprints. Pro-dubbed ferric cassette. 2-sided 5-panel J-card with artwork by Pepper Mill Rondo. Hausu Mountain co-founders Doug Kaplan and Max Allison record sample-based sound collages under the name Pepper Mill Rondo. Their debut album E.D.M. presents a mind-fracturing 100-minute menu of divergent styles and compositional strategies that features both duo and solo recordings, like a demented 21st century noise update of the credit-sharing Lennon/McCartney songwriting partnership. In the funhouse carnival world of Pepper Mill Rondo, E.D.M. stands for Ecstatic Dissonant Mashup, a descriptor fit for the duo’s collaborative improv sessions in which YouTube feeds and tape deck playback collide into spastic rhythmic permutations and garbled nightmare narratives of disembodied voice. Composed over the course of two years, the album seems to splay out into every direction at once, finding room for meticulously sculpted pieces stacked together in DAW editing software, alongside unhinged live karaoke vocal performances pumped through a rig of loop pedals and electronics. Featuring somewhere between 69,000 and 420,000 samples (by the duo’s own rough estimate), E.D.M. skips at random between chunks of pop culture and celebrity gossip, garbage from the infinite expanse of vlogs and video-on-demand, shards of anime and video game soundtracks, tropes of classic rock and pop history, and glimpses of the fervor of various cult-like fanbases. As selectors of the samples that populate their dense tracks, Kaplan and Allison subconsciously sketch a mosaic portrait of themselves and their interests, highlighting whatever sound sources make them laugh, cringe, or rub their temples in a state of abject headache. E.D.M. lands somewhere near the irreverent collaged odysseys of antecedents like The Residents, Negativland, and John Oswald, the radio-in-a-blender mashups of Girl Talk, the multimedia glitch compositions of Christian Marclay and Nobukazu Takemura, and the genre-colliding experiments of more recent touchstones like Daniel Lopatin or Nmesh. The album traces an oblique lineage from the earliest sample-repeating tape works and process pieces of minimalist composers like Terry Riley and Alvin Lucier, through the proto-meme tradition of culture jamming, on into the claustrophobia and stimulus overload inherent to the era of tabbed browsing. Pepper Mill Rondo present their listeners with a paralyzing program of sound designed to wash away this vivid simulation of the real world in favor of a fugue state of constant forgetting and half-remembering, a purgatory of blinding bliss and existential terror in equal doses. In addition to running the label together and co-habitating, the duo is 2/3 of the free-rock trio Good Willsmith, and release music separately as MrDougDoug and Mukqs.